Searching stocks on Google Finance just got easier. Google has integrated their wonderful Suggest Technology in Google Finance search [screenshot above]. 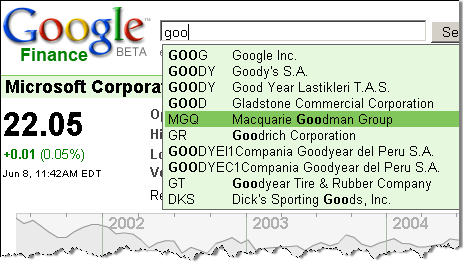 When you start typing a few words in Google Finance search box, it generates a green drop-down of companies whose name or stock symbol matches the search keywords. The names and symbols in the dynamic dropdown list are hyperlinks themselves.